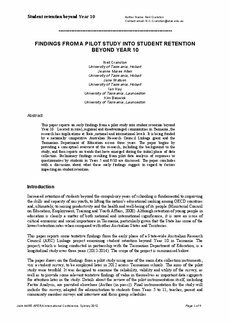 This paper reports on early findings from a pilot study into student retention beyond Year 10. Located in rural, regional and disadvantaged communities in Tasmania, the research has implications at State, national and international levels. It is being funded by a nationally competitive Australian Research Council Linkage grant and the Tasmanian Department of Education across three years. The paper begins by providing a conceptual overview of the research, including the background to the study, and then reports on trends that have emerged during the initial phase of data collection. Preliminary findings resulting from pilot data analysis of responses to questionnaires by students in Years 5 and 9/10 are discussed. The paper concludes with a discussion about what these early findings suggest in regard to factors impacting on student retention.